Jody Morris in his Chelsea days. 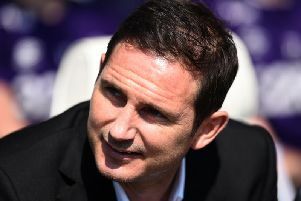 Derby County assistant manager Jody Morris says the pull of working alongside new Rams boss Frank Lampard was too good to turn down. Speaking to RamsTV, Morris said leaving his successful role as academy coach at Chelsea was tough but that the chance to work at a club like Derby County was a great opportunity. Frank Lampard will take charge of Derby next season. And he can't wait to get started as the new campaign comes into sight. He said: "I was planning a bit of a rest after a long season when I got a call from Frank saying something might be in the pipeline at Derby. "The club itself is a pull given the prestige it's held in English football for so long, and as talks progressed it became more and more attractive to me, which would have needed to be for me to leave my role at Chelsea as I was very happy there. "But the pull of the club and the chance to work with Frank was huge." Morris and Lampard go back a long way having played against and alongside each other since their teenage years. Morris said: "We actually played against each other as teenagers when he was at West Ham and I was with Chelsea, then we played together for the England under-21s. "We then had a couple of years as team-mates at Chelsea and have remained close friends ever since. As we got older it led to conversations as to what we'd do after football and he came into Chelsea to work with me as he was doing his coaching badges. "That was great in terms of having a legend around to help the young players, but also for the two of us to get a bit of work in together, which given we learned a lot will put us in good stead for when we get going here." Having watched on from afar as Derby just missed out on promotion last season, Morris believes he and Lampard can help the Rams push that one step further and achieve the return to the Premier League so desired by fans and hierarchy at Pride Park. He said: "The Premier League is the holy grail and you don't need to tell Derby fans how close they've got in recent years. "Obviously Frank and I want to put our stamp on the team and the players in terms of the way we'll play, set up against sides in the Championship and go about getting results, but I don't think we're too far away already because the consistency produced to frequently make the play-offs has been as good as anybody's. "So that's a good foundation to build on. It's about realising that there may be a few changes but at the same time not straying too far from the things that have served the club well. After all, ideally we'd like to avoid the play-offs altogether and go up automatically. "But without getting ahead of ourselves we just want to get our own stamp on things and hopefully doing that will help us put together some results to keep us in and around the top of the league. "We both believe in playing attractive football with high intensity and everyone working together with humility, winning the ball back as soon as possible and doing something with it. It's about being intelligent in possession and not using it unnecessarily. It's something a lot of coaches want, but it's a case of putting it into practice. Morris is now champing at the bit to get going, although patience is something he's having to have plenty of. He added: "I can't wait but it's been a bit frustrating up to now with lots of phone calls and also trips up to Derby to sort thing out - it's like the engine is revving but the handbrake is still on. "It's hard having not been in and around the players yet, so the first day of pre-season can't come quick enough really."